You’ll arrive at the airport and go through customs. JMC is really small so there’s not much confusion. When you get to customs you’ll present them with the form, just make sure you put your address where your saying on there. After you get your tourist visa stamp (US citizens usually get 90 days on arrival), you’ll go get your luggage. It’s right outside the customs and there are only 2 baggage claims. Then you’ll give your customs form to the officer upon leaving and they may scan your baggage if they want (not usually though unless it’s huge or something). There are usually about a thousand taxis there so transport isn’t really an issue. You can also connect to the wifi there at the airport and call an uber. One caveat is that sometimes Uber will call you (this is pretty normal there) to confirm where you are. They may ask you to go up a level and meet at departures instead of arrivals. The cost for a taxi to Medellin is about 70,000 pesos or ~$25. I believe there is some sort of cheap bus as well, but that is much less convenient. It’s about a 45 min ride to actually get to Medellin / Poblado where most people go. The best part is about 30 min in you start to see Medellin as you come down the mountain and the view is insane. If you’re coming at night you might also see a ton of cars parked by the “mirador” / lookout point as you come down the mountain. Lot’s of people come there to hangout, eat street vendor food, and show off how far the can ride super dangerous wheelies on their motorcycles. 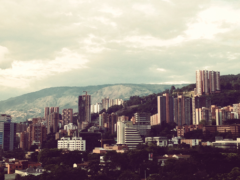 You can survive in Medellin without Spanish, but it’s not going to be easy as it’s generally not spoken. With that said, here is the most effective intro to the things you will need to know to get by on some basics. Some of it is vocab and some of it is cultural. I suggest getting the Google translate app on your phone. You can easily translate phrases on the fly, or even speak into it. Not perfect but can definitely help as your vocabulary is improving or looking up menu items. When you find a verb or phrase you don’t know, write that down immediately and ask your Spanish teacher (assuming you get one). Every time you do anything you think it’s going to be easy but it can seem like there are always questions. Way more than usual. Every time you order something, you think the response would be “ok” but it’s not. There are lots of clarifying questions or things that just come up and it can be difficult to navigate if your Spanish isn’t up to par. How to get groceries and everything associated with that (not much). How to order food at a restaurant, get the check, pay, split the bill, deal with money etc. (harder than you would think). How to answer the basic conversational questions / use paisa (Medellin) lingo. Directing cabs / general directions. You only have to talk when you check out. When you are ready to check out, they will ask “Tienes puntos?” or some combination of difficult to understand Spanish + the word “puntos”: This means do you have points, like those loyalty cards. They also may ask for the last 4 digits of the credit card. They also may ask if you want a 2nd receipt and voucher. You are just going to have to learn food vocab. I would really concentrate on this to begin with. You eat 3 times a day and it’s one of the only things you have to speak Spanish for, so it’s worth learning food vocab. “Que quiere tomar? / de tomar? / para tomar / Q deseas tomar?” – Tomar is “to take” or “to drink”. Responses are “me gustaría un vaso con agua (de la llave – from the tap, botella – in a bottle, con gas – with gas / carbonated, normal – no gas), or get a limonada de coco, best thing ever. Que término? – what cooking level do you want your meat? Responses include “medio” / medium. azul (rare), bien hecho/a (well done). DO NOT SAY “PUEDO TENER” THIS IS JUST WRONG. Con hielo o sin hielo? They ask you if you want ice in your water or not. After finishing, they will come up and ask you if they can take your plate. You can say “si, ya terminé” Yes, I have already finished. The check – “puede traernos la cuenta” (can you bring us the check) or “puede traerme la cuenta” (can you bring me the check) or just simply “la cuenta por favor” with the international hand signal for the check. Don’t be surprised if you have to flag someone down to get the check, or order, or get more water etc, that’s just the way it is. “Con tarjeta o efectivo?” Are you going to pay with card or with cash? “Tiene mas sencillo?” sincillo = simple. It’s uncommon to have change for anything bigger than a 20 mil peso bill. Nice chains / bigger restaurants will give you a bunch of change for a 50, so try to split your 50 mil pesos up whenever you can. Que hay? What is there / whats up? Salon Almador – Pretty cool club with DJs, more hipstery vibe. I’m a big fan of grocery delivery. There are a couple apps for it, one is called Rappi, another is called Mercadoni. Don’t want to pay your cell phone bill while you’re here? There is a good train system that connects all of Medellin. You can also order an Uber. They may ask you to sit in the front. They also might call you to confirm your location. Usually upon entry you will get a 90 day tourist visa. You can renew this another 90 days by going to immigration or by leaving and coming back. This does not renew automatically, even if the year changes. If you overstay your visa, you will need to go to immigration to pay a fine and they will usually make you leave the country as well, or they will make you book a ticket before you can pay the fine to get your “salvo conducto”. If you want to stay longer than 6 months in a year there are a variety of visa options and I suggest you review them with a lawyer. The lawyer I have used is Langon Colombia. This is an ongoing and constantly updated guide. Let me know if you have any questions in the comments below. I'm Clayton, nice to meet you. I like to write about startups, marketing, and living abroad. I also like to have a nice cocktail from time to time. Next one is one me. Thanks for such a comprehensive article Clayton. My flight arrives Nov 3rd (2016), I plan to stay for about three months. I’d love to get a drink After I get there!